Aston Martin are a luxury British auto-maker founded by Lionel Martin and Robert Bamford in the year 1913. They’re a proud part of British history and currently make some of the best cars available today. The name came from Lionel Martin, who used to race at Aston Hill. The companies international success is partly thanks to the number of world records that Aston have broken or set. Many records were broken during the French Grand Prix and they broke ten world records at the Brooklands Race Track. With their roots firmly in British racing soil, its no surprise that Aston Martin are now defined by the sweet spot they have found between elegance, madness and raw power. Many will remember Sean Connery driving the Silver Birch DB5 as James Bond in Goldfinger (1964) and Thunderball (1965), and many more will have seen (and cringed at) Daniel Craig absolutely hammering a DBS in Quantum of Solace (2008). Utterly gorgeous and dangerously sophisticated, Aston Martin is a brand worth owning. As an Aston owner, make sure you protect yourself with a Aston Martin car warranty from Warrantywise. We guarantee not to be beaten on price and cover for any Aston Martin car warranty. Beautiful, stunningly quick and brimming with class, the Aston Martin DB9 is the product of pioneering engineering and pure passion. This creation gets its genes from the almighty Vanquish but sets itself apart with its smaller more nimble body. The Aston Martin DBS is the louder, faster reincarnation of the outstanding DB9. The DBS looks sharper and more muscular than its older sibling and delivers even more impressive statistics on track due to its lightweight frame. This car could be described as a piece of art and it certainly leaves a lasting impression. Some cars most people will never see. Some cars will only ever be driven by the 1%. The Aston Martin One-77 is such a car. Starting prices are well over £1,000,000 and there was only 77 units ever made, all built by hand here in England. When somebody says your one in a million, there would still be sixty four of you just in the UK. The One-77 is one in ninety three million. The Aston Martin Rapide is yet another stunning creation from the luxury manufacturer. Its long sleeking body gives the look of extremely fast movement even when the Rapide is stationary. Put your foot down and the rich engine tone will fill the cabin as you soar ahead of other meagre cars. 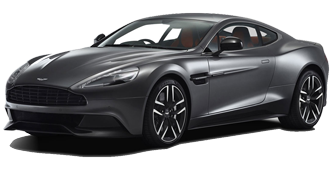 The Aston Martin Vanquish literally embodies the companies slogan “Power, beauty and soul”. Simply stunning in appearance, you will yearn for the Vanquish as soon as you set eyes on it. Phenomenal power and handling coupled with a gorgeous interior make this car one of our all time favourites. The Aston Martin Vantage is a high performance beast that manages to present itself in a very smart and handsome way. Sheer power is available to the driver, who is surrounded by quality materials and refined sound insulation. Available in V8 and V12 engines, the Vantage can be insane or simply unstoppable depending on your choice. The Aston Martin Vanquish Volante is a sublime grand tourer that offers angular, muscular looks with that smooth convertible finish. However, the interior is the real Pièce de résistance of the Volante as it offers some of the best looking trim and craftsmanship out there, with a steering wheel that can be blissfully coloured if requested.